Supported by North Wales FABI Programme. As part of this group, we hope to reduce the stigma of having a family member in prison, raise awareness and work to support both children and families who are affected. 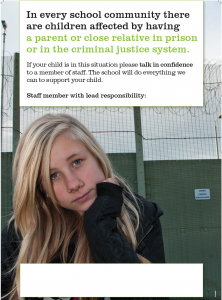 Having a parent or other family member in prison, can impact on a child’s sense of identity and how they interact with their family and community. Equally importantly, it can impact on their lives at school. We can offer trained staff, raised awareness, support and advice. KS2: Miss T Williams – Learning Coach and PPA cover.